Case Study – Independent Sponsor Buyout | Peninsula Capital Partners L.L.C. Steve F. and Ken A. The Situation: An independent sponsor group negotiated and signed letter-of-intent to acquire a company for a purchase multiple they believed to be attractive. The sponsors were experienced financial and operating professionals who believed they could add value to the family-owned business by professionalizing and updating financial systems and augmenting management depth. The Company: The business was a roadway signage structures fabricator with a strong market position in a number of Southeastern states. The company was family-owned with the family patriarch being the CEO who wished to monetize his equity ownership and partner with an investor group that would enable his transition to a less active role in the business sometime in the next few years. 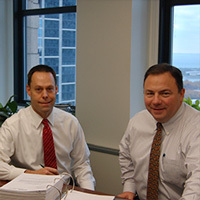 The Funding Request: The independent sponsor group required a financial sponsor that would provide all the required junior capital, including subordinated debt and equity, to complete the transaction with a structure that rewarded them for identifying and negotiating the acquisition, as well as allowed them to participate in the future success of the business they hope to help create via their management contributions. The Solution: Peninsula Capital concurred that the transaction price and future prospects of the business appeared favorable. We proposed a dual tranche investment comprised of subordinated debt and common equity which met the sponsor’s junior capital funding need. The sponsor group was provided a closing fee, an ongoing management fee opportunity and an equity promote package that remunerated them at closing for originating the transaction, as well as contingently rewarded them based on the future performance of the company. “Although we have been blessed with good fortunes in our business partnerships with Peninsula, we have learned the true value of our relationship during the occasional difficult situations our businesses have faced, as Peninsula brings an even-keeled approach to addressing business challenges. For example, our first investment with Peninsula closed in mid-2009, near the height of the financial crisis and financing market dislocations, Peninsula proved to be a quick study in evaluating and embracing not only the inherent risks in the markets, but also the risks in the business we were pursuing. Specifically, the financial risks of the transaction were amplified by the selling family shareholders’ desire for two of the three family members to exit their operating roles as CEO and Vice President of Operations upon consummation of the transaction, and the President and head of sales desire to retire following a transition period. Together, we were able to develop a management succession and transition plan that has been successfully implemented.